In the midst of all this snowy weather we've had lately, I find myself dreaming of tropical getaways and ocean breezes. To facilitate this (and further delude myself that this winter will actually end. Really.) I prepared a great summer meal. A Greek Salad full of juicy tomatoes, salty Kalamata olives and crumbled Feta. So good that I blogged about it already here. 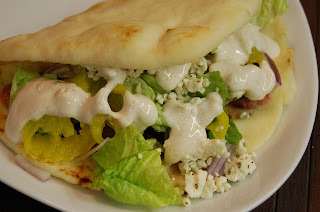 To go with I'd planned Chicken Gyros but I had a chance to go out to lunch with my oldest son earlier in the week and ended up ordering Chicken Gyros so I switched to Rachael Ray's Sliced Steak Gyros instead. The sauce was tasty and perfect for hubby who does not like cucumbers. His only complaint was that his vegetarian-prone wife made his gyro. Tons of toppings and very little meat! Next time, he's on his own! Preheat the broiler or a grill to medium. Drizzle the steak with the EVOO; season with salt and pepper. Cook, turning once, for medium-rare, 8 to 10 minutes. Let cool slightly, then thinly slice. While the steak is cooking, using a food processor, puree the feta, yogurt, lemon juice, garlic, oregano, cumin, coriander and hot sauce. Season with salt and pepper; transfer to a bowl. Char the pitas under the broiler or on the grill. Top with the steak and your choice of toppings. Serve with the lemon wedges and yogurt sauce. I think this is the time to eat something that will ruin my entire diet! My mouth is watering over the photo! It really looks so delicious. This sounds delicious. I love Gyros! It looks yummy. 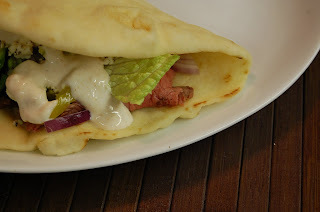 I love gyros, as well as pita bread. Sounds are so delicious. Such a wonderful dish in our festival time or a special days to celebrate. sounds are looks yummmmiiiiii. Every time crumbled feta cheese with salad make dish so tasty.